FlameShield™ high temperature, heat resistant stainless steel foil coated fabric (stainless steel foil coated) reflects radiant heat and is the perfect protection for covering equipment that is in close proximity to intense radiant sources such as super-hot metal slabs, liquid and molten metals or glass, open flame/plasma or engine exhaust manifolds. This heat reflective fabric reflects 95% or more of the radiant heat that contacts its surface. Constructed from a high-temperature base fiberglass fabric which is then coated with one layer of .002" thick of highly-reflective polished stainless steel foil. 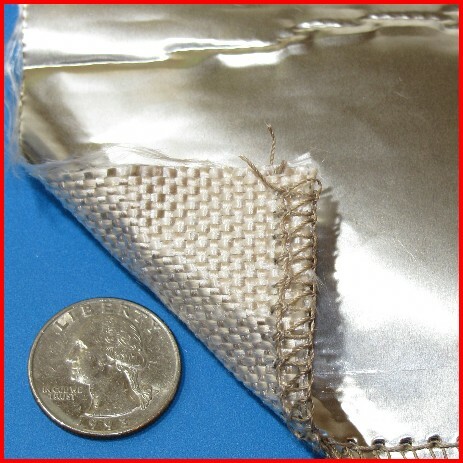 Designed for long term continuous operation at 1000°F / 520°C, this fabric will withstand short duration exposure up to 3000°F / 1650°C. Available in one fabric weight of 18 ounces per square yard with base materials of Fiberglass.